A new groundbreaking report undermines the lawfulness of the NSA’s invasive snooping. 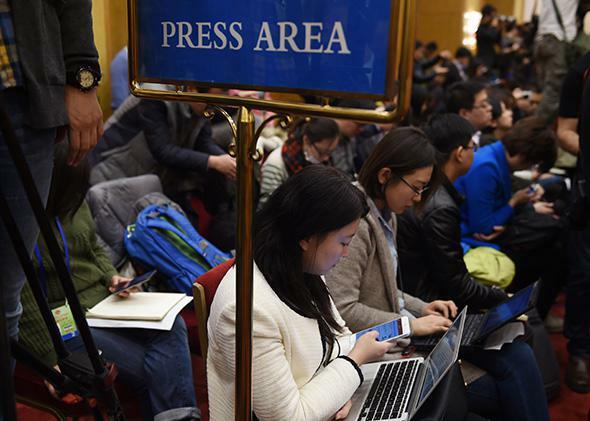 Journalists crowd a room in the Greal Hall of the People during the Xinjiang group meeting at the ongoing annual session of China’s legislature in Beijing on March 10, 2015. Around the world repressive governments are trying to stop Internet users from either posting anonymously or using encryption to communicate securely. Russia requires bloggers with more than 3,000 visitors to register with the state and identify themselves; pseudonyms are outlawed in Vietnam; Ecuador requires commenters on websites to use their real name; Pakistan’s government must grant approval for the use of encryption; and Ethiopia convicted members of the dissident blogging collective Zone 9 on terrorism charges based in part on participation in an online encryption workshop. In a groundbreaking report that was formally presented to the United Nation’s Human Rights Council on Wednesday (and is already available on its website now), David Kaye, the U.N.’s special rapporteur for the freedom of expression, has determined that such actions violate international law. Kaye’s argument is simple and elegant and basically goes like this: The ability to seek and receive information is a fundamental human right enshrined in international law. In order to fully exercise this right—particularly in an environment of growing state surveillance and targeted violence perpetrated by criminal and militant groups—people must be able to communicate securely. A government may only breach this private realm when its actions are established in law; when they serve to achieve a legitimate state objective, such as thwarting a terror plot or investigating criminal activity; when they are necessary to achieving this objective; and when they are a proportionate response, meaning the objective cannot be achieved through some less intrusive means. The opinions of the Special Rapporteur are non-binding, but highly influential. While Kaye’s report won’t stop repressive governments from doing whatever they want to do to restrict speech, it makes clear that such actions are neither legitimate nor legal. In the best-case scenario, his findings will spur countries committed to international legal principles to loosen restrictions on the use of anonymous speech and encryption to bring themselves into compliance. Targeted surveillance—in which governments monitor the communication of a specific individual—may be necessary and proportionate to thwart an identifiable threat. But mass surveillance by its nature is not proportionate because it involves governments sucking up vast quantities of information in response to vague threats in the hope of finding useful intelligence at some point in the future. Everyone, of course, is affected by mass surveillance but the influence on the work of the media is particularly dramatic. That is because, as Kaye notes in his report, journalists must be able to communicate securely in order to maintain the anonymity of their sources. Government that engage in mass surveillance can potentially used stored metadata to reconstruct journalistic communication and figure out who a journalist was talking to when, as outlined in an essay from the Committee to Protect Journalist’s Geoffrey King. While no one outside the National Security Agency knows precisely how the intelligence gathered through mass surveillance is exploited, what is clear is that the perception that email is not safe from government snooping has already produced a chilling effect on journalists and lawyers in the United States, according to the joint report “With Liberty to Monitor All” from Human Rights Watch and the ACLU. If the logic of Kaye’s argument is applied, then the mass surveillance program carried out by the NSA as revealed by Edward Snowden clearly violates international law. While that conclusion is unlikely to influence the domestic political debate in the United States, it’s critically important in an international context. This is because revelation of the NSA mass surveillance program legitimated efforts by governments around the world—from China to Iran—to strengthen their own mass surveillance programs and expand their global reach. The alleged hacking by China of the U.S. Office of Personnel Management—which according to some reports Beijing may be using it build a massive database—give a sense of China’s ambitions. Surveillance technology is like drone technology. Right now, the United States has a tremendous advantage. But as surveillance technology becomes less expensive and other states develop their snooping capabilities, the advantage will fade. That is why it is so important to ensure that the limits of spying are defined by international legal principles, not the whims of the state. The NSA revelations certainly made it harder to hold the Chinese government accountable. At a meeting on Internet governance held in Bali, Indonesia in October 2013 soon after the Snowden revelations, a U.S. official who sought to defend the NSA surveillance program was booed by the delegates and admonished by a Chinese counterpart who suggested that the United States should look in the mirror. As Kaye noted in his report, “Encryption and anonymity, separately or together, create a zone of privacy to protect opinion and belief.” Preserving this zone of privacy—a zone that journalists, human rights defenders, and political advocates need to inhabit to in order to be effective—requires that the online tools that protect us from snooping governments are readily available. But it also requires the creation of agreed upon legal norms that isolate the large number of repressive countries that are increasing their capacity for surveillance. The NSA mass surveillance program made it much more difficult to do so and undoing the damage internationally will be a hugely difficult task that will take years. Kaye’s report is a crucial first step.